The 300Mbps Wireless N Home Router delivers the highest level of security with 12x the speed and 4x the range of wireless g products. 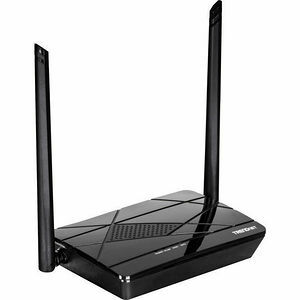 Quickly install the router and use it with TRENDnet wireless n adapters to receive the full benefits of wireless n speed and coverage. The latest in wireless encryption and a secure firewall provide the ultimate in wired and wireless security. Advanced Multiple Input Multiple Output (MIMO) antenna technology delivers expansive coverage and eliminates dead spots. A quick and intuitive installation process, one touch wireless connection using Wi-Fi Protected Setup and advanced management capabilities make this product well suited for your most demanding home networking needs.